Rewards programs are meant to encourage loyalty. In an ideal world, you could join just one mileage program that would reward you for every single transaction you make, from flights to credit card purchases to restaurant meals. With that kind of set up, many of us could achieve elite status without even trying. But in the real world, it's pretty much impossible to join only one program that rewards us for everything we buy. That means that if you are a dedicated rewards collector, you'll have to join more than one program. However, you don't want to actively use too many programs. If you spread your earnings too thin, chances are you'll lose track of points you've accrued, or they'll simply expire before you ever get enough of them to redeem. Most of us only have so much time and attention to devote to tracking our miles and points. But how to know which ones to focus on? Here are some considerations. It's almost summer camp sign-up season, which means I really need to decide on my next international destination ASAP. Why are these two things related? Well, major expenses like camp fees are good opportunities to quickly reach the minimum spend required by most credit card bonus offers. But you don't want to sign up for just any new card. You want to figure out which new card can get you to your chosen destination. When I'm planning a trip, the first thing I do is plug my starting point and destination into Google Flights and take note of what airlines fly from Point A to Point B. That way, I can look at offers for cards and programs that could get me flights on one of those airlines. My next frequent flyer trip will probably be a family vacation to France. For that reason, I won't be focusing on accumulating miles for Hawaiian Airlines or Southwest Airlines right now, because neither of them fly into Paris. If you are more like my parents, who don't travel internationally but visit the San Francisco area about twice a year, this also plays into your rewards program strategy. If this is your situation, you may want to focus on the awards program for the airline you typically take, and look for ways to get more points within that program. My parents already have credit cards for their preferred airline, but I showed them that they could earn more points by making online purchases through the airline's shopping portal and by registering their cards with the airline's dining program. Before you apply for any new credit cards, online shopping programs, dining programs, etc., do an inventory of all the programs you hold points in. If you have the choice of two airlines to get to your desired destination, and you already have one-third of the needed miles in a frequent flyer account for that airline, you're better off looking for opportunities to earn more of those miles, rather than starting fresh with the other airline. When surveying your rewards programs, also take note of exchange partners. For instance, the large card-issuing banks and several hotel programs allow you to transfer points into certain airline programs. If you are able to combine points from various programs, you may realize you're a lot closer to getting that award seat than you thought. Like department stores offering sales, credit cards vary the number of bonus miles they offer for new sign-ups. Since you generally can't apply for the same credit cards and still get the sign-up bonuses over and over, it pays to apply only when you're getting a good deal, like 60,000 sign-up points instead of 40,000. Check mileage blogs such as One Mile at a Time, which keeps a list of the hottest card deals each month. Say you want to accumulate a lot of a certain airline's miles, so you apply for a co-branded credit card and immediately earn 40,000 bonus miles. What next? I already mentioned that online shopping and dining programs are opportunities to increase the amount of miles you're earning. Another tactic is to find out if the same program offers credit card products besides the one you already have. Many airlines offer a basic and a premium card, with varying annual fees; you can usually get both. If you and your spouse are working together toward a trip, don't forget you can each get a separate account in your own name, reaping your own sign-up bonuses. Better yet, you can often get bonus miles for referring one another as new members. If you have a small business, look for a business card within the same rewards program; you may be able to get the business card in addition to the consumer card. I recently received an emailed offer — which I had to click to register for — to get three miles for every dollar spent on certain categories on one of my airline cards. This is a card I have sitting in a drawer and rarely use, but now that I'm signed up for this promotion, I'll get it out and use it on those categories. A good way to remember which cards to use for which purchases is to label the card with a marker or sticker. Some programs offer ongoing promotions that last the whole year; if you're going for one of these, keep an eye on the calendar. For instance, if you accrue 110,000 points on Southwest Airlines' Rapid Rewards program in a calendar year, they'll give you a free companion pass for the entire following year. My sister-in-law earned this award by putting all household spending on a single Southwest-branded card, starting early in the year. I didn't do as well. A couple years ago, I applied for a new Southwest credit card toward the end of the year, and realized only after the year had ended that I was only about 10,000 points away from earning the companion pass. It's clearly a better idea to start working toward such a large goal in spring than it is in late fall. Once you've reaped the sign-up bonus for a new credit card, take a hard look at what the card can do for you from here on out. Some cards offer an annual bonus of miles or a free hotel night, while others only offer one mile per dollar spent. If the card charges an annual fee but doesn't offer much in the way of ongoing rewards, once I've reaped the sign-up bonus, I call to cancel. Sometimes when I call, I'm offered a new ongoing reward, such as an additional bonus if I spend a certain amount within the next few months. If the card doesn't charge an annual fee but isn't going to offer continuing rewards, I may keep it, but relegate it to the drawer. That way, I don't have to flip through 10 different credit cards in my wallet every time I want to pay for something, but the account is still open. Why not cancel? Well, two components of a credit score are the average age of accounts and the amount of credit you have available to you. So if the card isn't costing me anything, I'd rather let it languish in a drawer, quietly bolstering my credit score, rather than cancel it. When you do that survey of your current miles and points holdings, you may discover an account here and there that only has spare change rattling around in the bank. Maybe you flew that airline just once, or spent most of your points and forgot about the last 2,000. Take this opportunity to clean out those accounts before the miles expire. Since you probably don't have enough points for a flight, consider a miles for magazines offer, or see if you can transfer the points to a program you use more often. If you feel like you're spending too much time applying for new cards, or if you worry about putting too many new accounts on your credit record, avoid smaller bonuses and look for cards that offer a large bonus for a large commitment. Typical bonus offers are in the range of 40,000 to 60,000 miles, or points for a minimum spend of $1,000 to $3,000. But for the past few months, I've been putting my expenses on a card that pays a 75,000-point bonus for $10,000 in spending in the first year. I've appreciated being able to take a break from applying for new cards, while still being able to work toward a bonus. Maintaining multiple rewards accounts is not for everyone. It's a geek pursuit for people who really want to maximize the value they get for their spending. 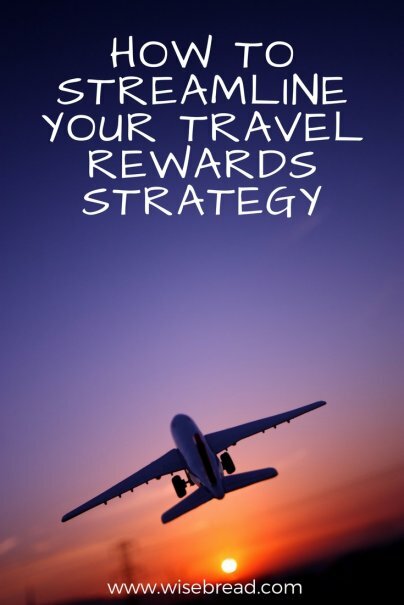 If you have multiple frequent flyer accounts, a bank-based rewards account, and two hotel loyalty programs, you may find yourself unable to keep up. One solution is to drop them all in favor of a single cash-back card, since cash is accepted everywhere. Another option is a rewards card that offers the option to redeem points for travel on almost any airline via a branded portal.